I have been so busy with other things lately, that canning anything hasn’t made it onto my to do list, let alone crossed my mind. Last weekend, however, as some of my major projects have been winding down, I began wondering if Concord grapes were ready for picking yet. Friday morning I called the only farm within 50 miles for grape picking and found out grape season was already closed. WHAT! How could that be? Concords don’t usually even ripen until the beginning of October here in Michigan, how could the season already be done? 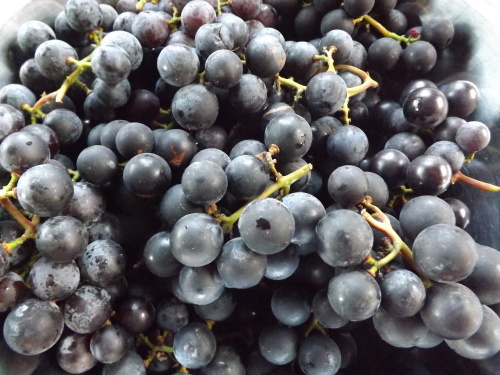 Well, apparently the harsh Michigan weather we endured last winter took its toll on the grape crops and the season was very short and not very plentiful. Discouraged, I began to look for farms that were further out, but still feasible. There were none. My only other option was to start calling farmer’s markets and see if anyone had grapes I could buy. Monday morning I called my favorite farm, Verellen Farms, and found out they had Michigan Concords. I drove there immediately, and by 9 a.m. was back home with 3 pecks of Concords for processing. For two days now I’ve been working on grape juices, jams, spreads, and syrup. Check out Simply Grateful Canning for my posts on Concord Grape Juice Revisited, Updated, & Expanded – Cran Grape Juice, Cran-Grape Syrup & Spread, and Cran-Grape Jam – Not Traditional. 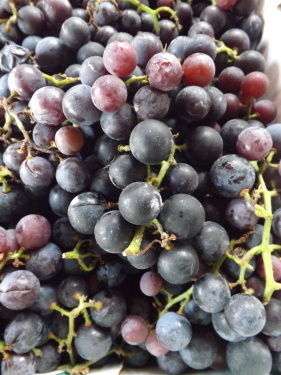 I’ve got about a peck left and with that I think I might try an old-fashioned recipe for grape juice to compare it with the easy recipe I’ve done for two years now. 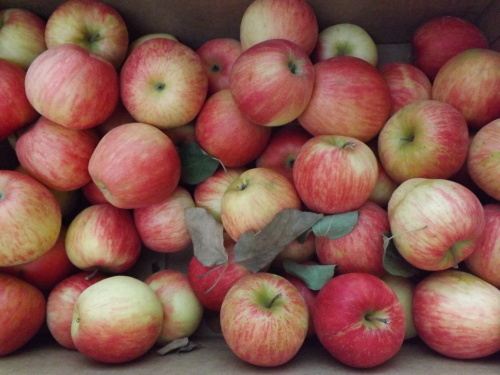 Michigan weather can be brutal, especially when it comes to fruit trees. Thankfully this year I was still able to get some Concords, enough to stock the pantry for a good year or more, and for this I am — Simply Grateful. Now that the garden is finally coming to an end, it is time to reflect on the successes and failures of my 2015 gardening season. Today I spent some time reminiscing about my corn crop and the utter failure that turned into a booming success. 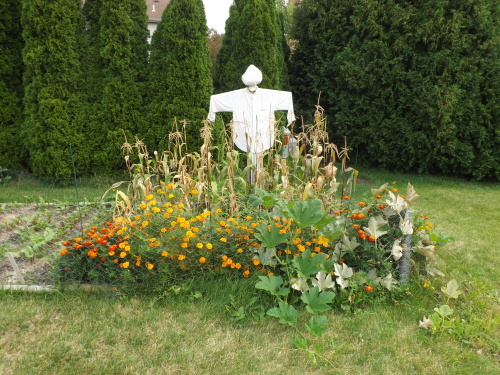 Read all about it on Simply Grateful Gardener, Corn Catastrophe. Not every mistake I made this year turned out so well, but this was probably the biggest mistake. Next year I hope to grow corn we can actually eat and enjoy. For now, I will find comfort in knowing that it wasn’t a total loss. Every cloud has a silver lining, and for this I am — Simply Grateful. Baby, it’s cold outside! Yep, fall has definitely set in here in Michigan. With temperatures in the 40’s the past few days and dipping below freezing at night, I’d have to say summer is officially over. 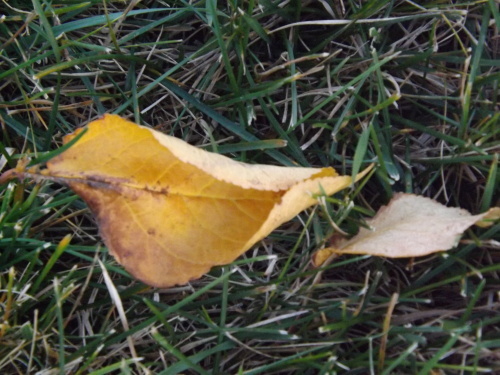 I am happy that fall has come and the weather has been so agreeable. Very little rain, fairly mild winds, and for the most part the temperatures have been in the 60’s. 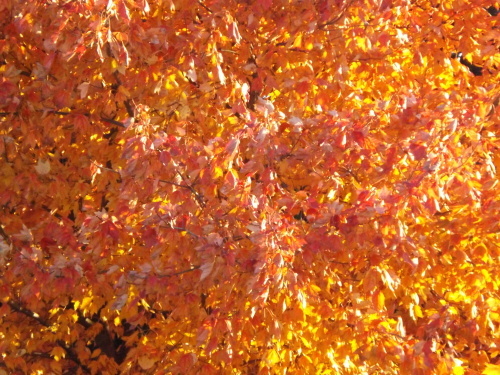 Typically it seems that as soon as the leaves begin to change, the winds pick up and blow them off their branches before we have time to really enjoy the colors. Not so this year. Besides the cooler temperatures, the best part of fall would have to be the return of comfort food. Many dishes that I make all year long are somehow different, warmer, more fulfilling come fall. Not until the hot days of summer have left us for another year do these meals once again regain their “comfort” status. Today we enjoyed a hearty meal of homemade chicken soup and Chicken In Herbed Gravy Over Rice (recipe found on Simply Grateful Cooking). 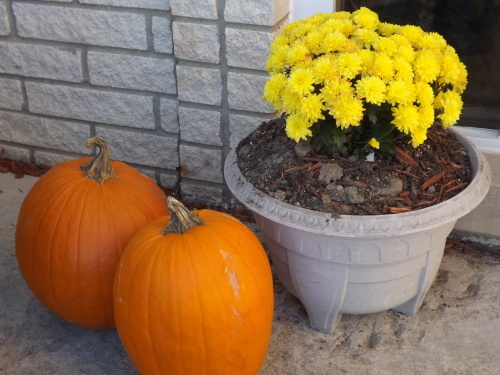 Loving fall in Michigan, and for this I am — Simply Grateful. The other day I decided to have an apple for a snack. As I cut it into slices, I remembered that I had some caramels sitting in the cabinet. There was no way I was about to unwrap the entire bag and melt them down to make caramel apples, I didn’t have that kind of time or inclination. So in order to enjoy that “caramel apple” taste without making a caramel apple, I opened up one caramel and cut it into pieces. 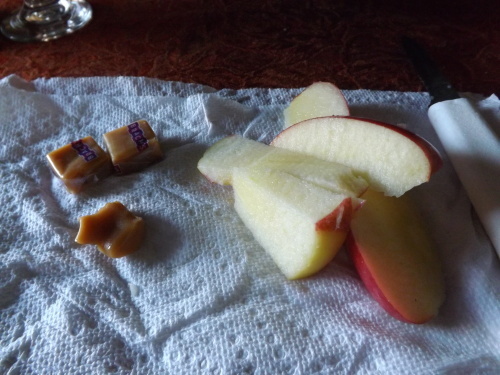 Then, as I ate a piece of apple, I popped a piece of caramel into my mouth too. Viola! Caramel Apples–sort of. As good as this tasted, I knew there had to be a better way. My first thought was to see what sauces my cookbooks had. My search gave me several options, but because they used white sugar, they would take more time than I had. So finally I found a recipe using brown sugar. This cut the time to make a dipping sauce down considerably – instead of 30 or more minutes standing over the store, I would spend less than 10 minutes. Perfect. The recipe I ended up with turned out great and can be found on Simply Grateful Cooking, Caramel Apples The Easy Way. Now the next thing I want to see if I can make is a caramel dipping sauce that can be canned and stored on the pantry shelf for 6 months or more. Another project to tackle this winter. 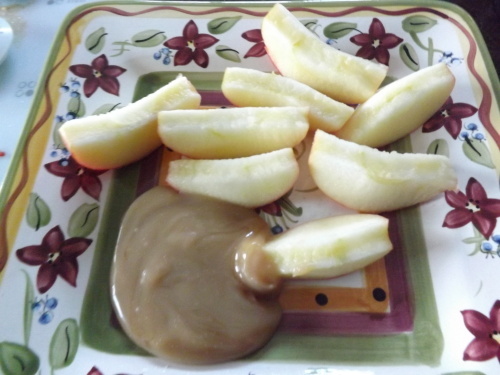 For now, we are enjoying Michigan Honey Crisp Apples with homemade caramel sauce and loving every bite, and for this I am — Simply Grateful. After being gifted with quite a few zucchini this past summer by friends and family, I am excited at the prospect of growing my very own next summer. 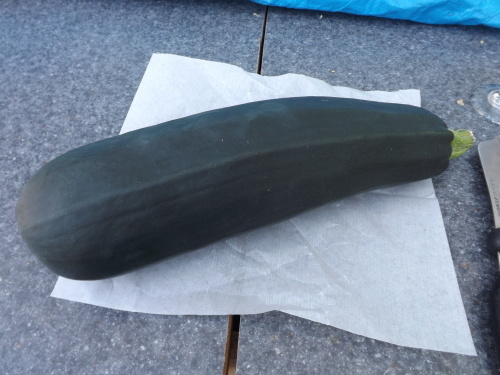 I have heard from nearly everyone who has grown it that I’ll probably get more zucchini than I’ll know what to do with, but somehow I doubt that. With the new recipe for Shredded Zucchini Faux Pineapple (found on Simply Grateful Canning) that I made this past summer, the Glazed Pineapple-Zucchini Upside Down Cupcakes (recipe found on Simply Grateful Cooking), and the many other recipes I have planned for all the shredded zucchini I froze in my new upright freezer, I can’t imagine having enough let alone too much. I even have two new recipes I’ve made up on my own that I didn’t have enough zucchini to test this year, so those are on my 2016 Canning To Do List — can’t wait. For now, I’ll be dreaming of zucchini and hoping that growing this is as bountiful as my peppers were this year (912 and counting) and my cucumbers were last year (302 for the season). Just think what I’d be able to do with just a fraction of my cucumber total for 2014 — the possibilities are endless. Dreaming and planning for the 2016 garden, and for this I am — Simply Grateful. Ice Cream, Cake & Hot Fudge — What More Can You Ask For? I love ice cream with cake and yet probably the only time I think to scoop an ice-cold spoon of vanilla ice cream onto a slice of cake is at a birthday party. Making an ice cream cake and then topping it off with some steaming hot fudge is like having a birthday celebration on steroids. This Hot Fudge Ice Cream Cake isn’t my invention. I first had this dessert at a Big Boy restaurant here in Michigan and enjoyed it for years growing up. Not frequenting restaurants now that I’m older, the memory of this dessert made me long for just one more taste, thus I had to come up with a homemade version. At first I thought this would be time-consuming and labor-intensive, but because it uses a boxed cake, the recipe is super easy. Perhaps in the future I might use a homemade cake in the recipe, but for now, with time being short most of the time, this recipe worked out perfect for me. 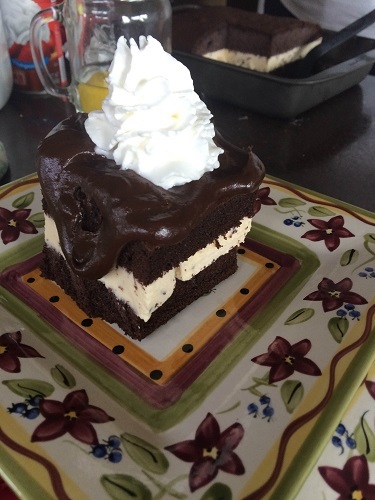 Check out Simply Grateful Cooking, Hot Fudge Ice Cream Cake, for the recipe. As busy as each day tends to be, it’s nice to have recipes that can still be completed with minimal effort and just a little time, and for this I am — Simply Grateful. I cannot believe it has been more than a month since my last post. It has been so very busy this past month and blogging is not the only aspect of my life that has been neglected. 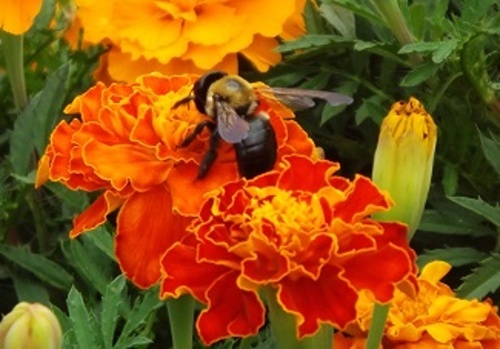 Between the garden, canning, remodeling Zeb’s room, cleaning out the clutter in the basement, and getting the kids back into some sort of routine with the onset of school again, it has been a challenge just to get dinner on the table and laundry on the line. I have a journal with lists of posts for each of my blogs that need to be done and I can’t even look at it. It is far too overwhelming how many posts I am behind on. Simply Grateful Canning alone has at least 30 posts that I am behind on, not to mention all the gardening updates for Simply Grateful Gardener that I never got to and the new recipes (albeit few) that have piled up and are waiting to be shared on Simply Grateful Cooking. At this point, trying to play catch-up seems pointless because my posts won’t be timely. Still, I did finally go take a look at how many hits I got while not posting, and the traffic was actually fairly consistent. People find my posts by Googling subjects that I write about click on the links. I guess how timely I am won’t really matter in the long run if it’s there when someone is looking for it at another time. Dealing with the no-blogging guilt however is another matter. 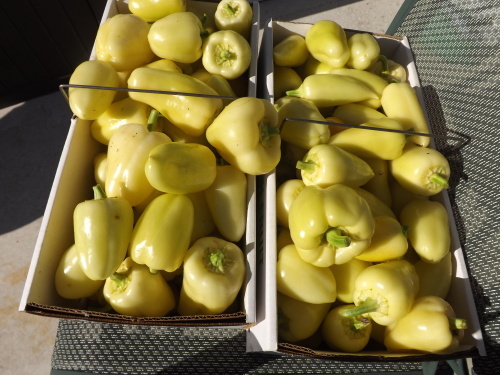 This morning I did finally make a post on Simply Grateful Gardener updating my pepper progress — Summer In The Pepper Mines. It gives a little insight as to what my time has been consumed with this past month and what continues to plague me. For now, I am going to try to get back into this by setting aside at least an hour a day to make a post of some sort and get back into the groove. I have missed this and have missed reading blogs as well. My first post in more than month — for this I am — Simply Grateful.